Last year, I bought my Christmas decorations in December which means I got the left over items no one wanted. You would think I would learn my lesson but I didn’t. I bought my fall decorations late this year too. I wasn’t going to make that mistake again; I decided to do my Christmas decoration shopping in November. So today’s post is a Christmas Home Decor Haul! The color scheme I’m going for is gold, silver and white… Which makes me realize I am becoming my mom. Anyways, I’ve been looking for a white nutcracker for about a year now and I was about to give up. 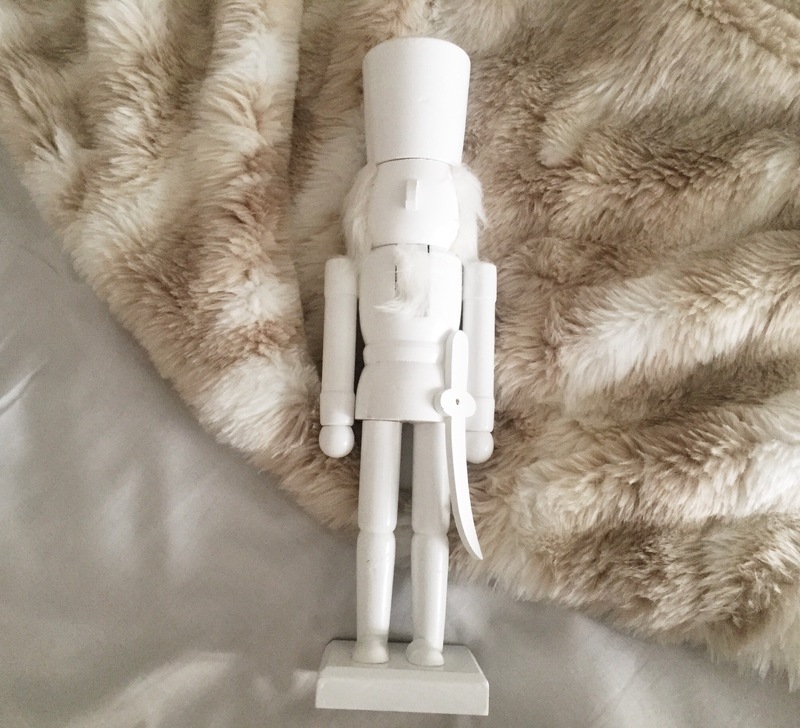 I was even thinking of buying a crappy nutcracker just to repaint it white. Somehow I found one at Home Goods and it wasn’t expensive! Yay!!! My geometric shape love has no boundaries. I found this cute geometric shape tree topper! Apparently this called it the Himmeli Star. I know I could of made it myself but I’m kinda busy at the moment. I ordered this on Etsy, I can’t wait to get it! I did a Christmas banner tutorial last year, but I’m kinda done with the burlap decor. I found this wooden banner kit at JoAnns. I figured I could paint it and make a new one.. Keep your eyes out for a DIY post! I believe candles are a huge part of your home decor. Decorations are nice, but if your home smells a bit off then people are not going to look at the decor. They’ll be more focused on the smell. I decided I should buy a Christmas candle this year. I bought Diptyque‘s Liquidambar candle; it has a cinnamon scent with a hint of sweetness. I’m slowly adding more Christmas decorations, but this is what I got recently. Are you planning on buying Christmas decorations this year? Let me know where you plan to shop! Thanks for reading today’s post. If you liked today’s post, please click the like button and don’t forget to subscribe!